Teased by a gunner of a local Samajwadi Party leader at a traffic signal, a woman decided not to lay low and smashed his car. Allegedly teased by a gunner of a local Samajwadi Party leader at a traffic signal, a gutsy woman here decided not to take it lying down and jumped atop the leader’s Mercedes and smashed the windshield after tearing off the party flag on the bonnet. The two-minute video of the woman’s act took social media by storm, with most people sharing the links online. The incident took place on Sunday evening when the woman identified as 23-year-old Sadhvi Pandey along with her sister was going to see a doctor on a scooty. When they were waiting at a crossing, the cavalcade of Abhinav Sharma stopped alongside and the gunner allegedly winked at her from inside the car. Not to take it lying down, Pandey stopped the car and broke off the chain of Sharma who came out. As she was taking a photo of the gunner with her mobile, some of the guards in the cavalcade came running and allegedly broke her mobile phone. 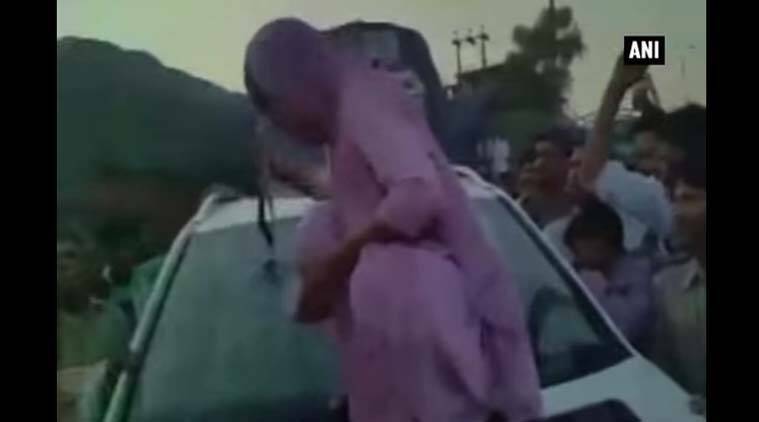 This infuriated the woman further and she climbed on the bonnet of Sharma’s Mercedes car and tore off the party flag fixed on the bonnet and used it to break the windshield. Reacting to the incident, SP’s Naresh Aggarwal said, “Abhinav Sharma is not leader of SP. This is a fashion in Uttar Pradesh, people generally carry the flag of the ruling party”. Sharma, whose car was damaged in the incident, said he has fired the gunman. “If she would have at least once told me that my gunner had made a lewd gesture, I would have beaten up the gunner at the same time. But as soon as I tried to talk to her, she broke my chain, she started damaging my car. What could I have done at that time. Should I have fought with Sadhvi. She just damaged my car,” he said. Sharma said, “Sadhvi damaged his car without any reason. For no reason, she ruined my spotless reputation. I have fired my gunman although he was saying while crying that ‘sir I had just asked for a side and nothing'”. The woman, who is being lauded on social media for taking on the gunner, said, “There was no bravery in my act. You could have also reacted in the same manner if anything you had purchased with your hard earned money had broken. Had they not broken my mobile and had taken action against the guard, we would not have gone so extreme”.